Alison Lurie (b. 1926) is best known for her ten novels, which include The War Between the Tates (1974) and the Pulitzer Prize-winning Foreign Affairs (1984). She has also published the popular sociological study The Language of Clothes (1981), and two books on children's literature, Don't Tell the Grown-Ups (1990) and Boys and Girls Forever (2003). 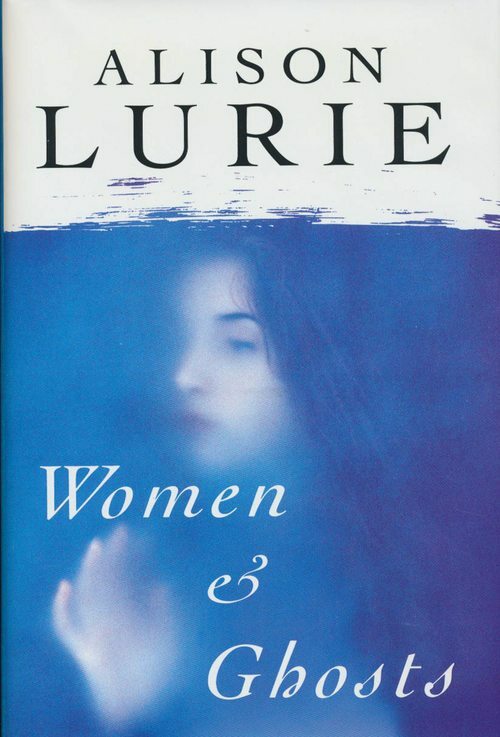 Lurie also edited The Oxford Book of Fairy-Tales (1993), and wrote three volumes of children's stories, The Heavenly Zoo (1979), Clever Gretchen and Other Forgotten Folk Tales (1980), and Fabulous Beasts (1981). The Black Geese (1999) is an illustrated book of the tale of the Baba Yaga from Clever Gretchen. I finished a novel and didn't have a really good idea for the next one. I have a folder full of notes and ideas that I've accumulated for many, many years, so I looked through it. One note was about how my sister and I were sorting my mother's furniture and possessions after she died. I looked at one antique and said, 'How come you're still here and our mother's gone?' I felt irritated about it and thought, 'You don't even care. All you care about is if we take good care of you.' A woman just having this thought isn't very interesting, but then I thought, 'What if this piece of furniture really did have feelings?' It's easy for me to think in this way, because I've read a lot of children's literature in which everything is anthropomorphized, and I've read a lot of ghost stories. Then I began to look at other ideas in the folder and realized that if I allowed the supernatural, suddenly there were all sorts of possibilities. (The Washington Post Book World, 23 October 1994). 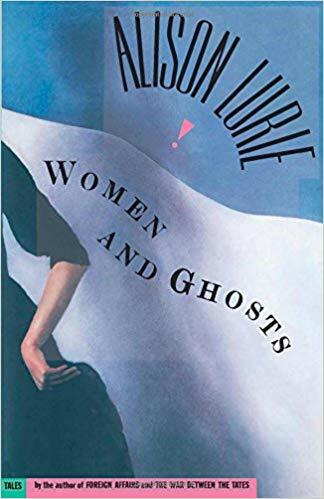 And Lurie's ghost stories are not wholly different from her novels of relationships between academic men and woman, though she has added aspects of the supernatural. Some concern hauntings from the past, or hauntings of a room or even a pool. The best story in the collection concerns a poet who find that a doppelganger is apparently impersonating her at appearances across the U.S. Settings range from Key West to England (including an intriguing tale of the sheep in the Lake District) to India. All are well told, and Lurie's characteristic style make them stand out as different from even the best of the usual fare. 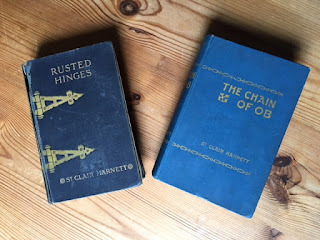 In the opening of The Chain of Ob (Andrew Melrose, 1913) by St Clair Harnett, two Chelsea bohemians travel to a remote Cornish ruin one of them has inherited, a cobweb-hung hall with creaking doors, mildewed furnishings and vast shadows. The farmer who takes them there through narrow lanes as dusk approaches admits that “they do say as how” it is haunted, and is anxious to be away. This is the sort of beginning to a supernatural yarn that I really relish, and things continue to be splendidly rustling and creepy. Reader, there was, and before you know it the narrator has slipped into the 17th century and encounters this beautiful witch. Here he learns that “there are divers souls that are ever subjected to unseen powers. When they are born they bear a badge upon their persons, the Chain of Ob.” He too bears the symbol. He continues to cross over between his contemporary time and the era of his spectral lover, as they both try to avoid the baleful influence of the mark upon them. There was in the interwar period a cluster of enjoyable novels about timeslips, and I’ve already written here about Fanfaronade (1934) by Ivo Pakenham: another fine example is Lovers’ Meeting (1940) by Eleanor Smith. But The Chain of Ob seems to be a quite early example, and is very satisfyingly full-blooded. You have the sense the author was enjoying it to the full and this engages the reader. Air Commodore Edward St Clair Harnett (b. 1881) served in the RAF in Iraq in WW1 where he knew Gertrude Bell. In civilian life he was a barrister who wrote A Handbook on the Law of Mortgages (1909): we are reminded that Bram Stoker was also the author of a legal textbook. Harnett's wife, Dorothy Grace Harnett (b. Co. Cavan, ca. 1891) wrote as “D. G. Waring” a series of eight novels in the 1930s, giving rise to the suspicion (I forget where I read this) that she may have written her husband’s books too. She served in the Red Cross during the First World War and they married on 15 April 1916. But in fact both this and an earlier book, Rusted Hinges, A Novel On a New Plan (Andrew Melrose, 1912) were published a few years before they were married, and presumably written even earlier, when she was 21 or younger: so while still possible, this does not seem likely. They might, of course, have collaborated. The couple had one son, Denis Henry Waring (1917–1964), but the marriage ended some years later, and in 1927 St Clair Harnett remarried. There are traces of an article, "Gertrude Bell and the Iraq Museum" by St. Clair Harnett, Views and Reviews, Vol.22 No.3, 1927-1928, which may link with the third novel under his name, The House of a Thousand Lamps (Selwyn & Blount, 1927), set in Baghdad. He donated to Birmingham City Museum forty two Near Eastern seals collected in Baghdad and died in 1964 or 1965 at the age of 83. 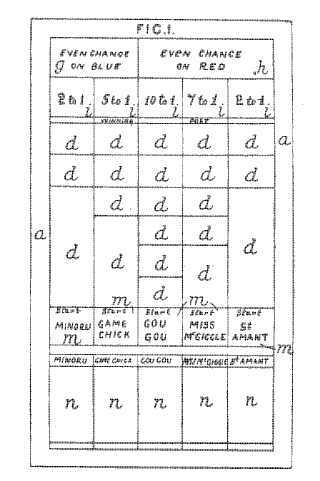 “A race game, which may be used for advertising, is played with model horses which are moved over a board (a), divided into a number of spaces (d) representing the course, two or more spaces (y), (h), and other spaces (i) marked with the odds against the pieces in use. 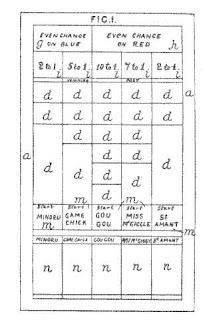 The names of the pieces are shown in spaces (m), and other spaces (n) may be provided for the reception of the cards to be dealt to each piece. Although a variety of horse racing games involving cards or dice have been marketed, there does not seem to be one exactly like Harnett’s game. Clearly it is time for some enthusiastic amateurs to do a mock-up of the board and play the game for the first time, no doubt, in over a hundred years. Who knows whether as the cards fall and the toy horses move, there might be a queer flicker and the players will find themselves in evening dress, smoking Sullivans over a green baize table in that last Edwardian summer? 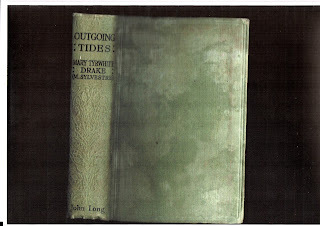 Mary Tyrwhitt Drake’s Outgoing Tides (John Long, 1924) is sensationalist fiction pitched strong. An ex soldier, a VC, is now a starving artist, languishing in attic digs with an exiled Russian prince who makes a sort of living as a parlour pianist. The artist has been forced to sell his Scottish ancestral home — he is, of course, descended from French courtiers of Mary, Queen of Scots. He bumps into the man he saved in Flanders, who feeds him and funds him for a bit. This chum has a sultry lover, who agrees to pose for the artist’s Gothic portrait of Persephone, ‘The Queen of Hell’. Complications ensue. Meanwhile, the woman in the neighbouring garret dies, leaving him the solemn charge of her 18 year old daughter, a working-glass girl of faultless morals. Complications ensue. Anthony, the artist, decides to abandon the high calling of his art in favour of pictures that will sell, and to marry his ward. The pianist prince is unconvinced. At this point, the new owner of the old Scottish chateau, a pleasant young woman of faultless, etc., devoted to good causes, appears upon the scene. Complications ensue. This, note, is only the first third of the book and there is a lot more to come. An uncanny element is implied from the dark influence of the painting of Persephone and its effect on those who posses it, or are possessed by it. What I like about this book is its thoroughgoing melodrama. We have met such characters before – the down-and-out Great War veteran encountering a pal in the murk of London, the impoverished aristocratic White Russian, the sinuous femme fatale, the orphaned ward, but seldom all flung together at once and at such pace. There’s a sort of extravagant gusto about the whole shebang which fills the reader with bemused awe. Sometimes we need such a bracing change from more cautious and considered literature: if only she could have met Henry James. We are in M P Shiel terrain, though without his rhodomontade, or perhaps perilously close to the extravagant plots of William Le Queux, but in prose more vivid and vivacious. Under the pen-name ‘M.A. Sylvestre’, the author had earlier published Valencia Varelst (S.C. Brown, Lanham & Co, 1903) and The Light-Bearers (John Long, 1912). In an obscurely pleasing sort of way, the pale green boards of my copy (illustrated) have a series of salt-crust surges across them, as if indeed marked by outgoing tides. 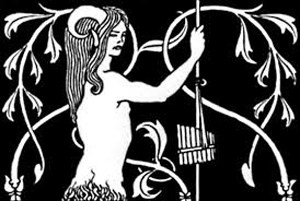 The latest issue, number 37, of Faunus, the hardback journal of The Friends of Arthur Machen, has just been published. Edited by James Machin and Timothy J Jarvis, it offers a cornucopia of fascinating material by and about the great Welsh master. From Arthur Machen himself there is a rare and significant essay, ‘Folklore and Legends of the North’, surveying several books in the field and discussing his own views on lycanthropy, witchcraft, metamorphosis and the fairy world. This is an important and interesting account of these traditions which will illuminate his own fiction. This issue also includes a review by Aleister Crowley of Machen’s The Terror, and an introduction to this by James Machin reflecting on the mage’s admiration (usually) for Machen’s work, and the circumstances of this particular notice. The editors also include a fine tribute to Machen by the Irish novelist Norah Hoult, in her 1951 review of The Autobiography of Arthur Machen. John Llewellyn Probert continues his series on ‘Machenesque Moments in Cinema’, Nicolas Granger-Taylor reviews a recent modern opera inspired by Machen, by Ross Crean, and Nick Louras discusses the recipe for Machen’s lethal Dog & Duck punch. Members of the Friends should receive their copy in the next few weeks, complete with Machenalia, the newsletter edited by Jon Preece. To join, and receive these splendid publications, consult the link above.